As well as releasing a swanky new trailer for Castlevania: Lords of Shadow - Mirror of Fate, Konami has given a few more details on the basic story, as well as revealing the actors who will be lending their vocal talents to the game. Mirror of Fate focuses on Simon and Trevor Belmont, who - in the alternative universe created for the Lords of Shadow series - are both descendants of Gabriel Belmont. Gabriel will be a playable character early in the game, prior to his transformation into Dracula. Also appearing is Dracula's other son Alucard, although at this stage it's not known how he fits into the alternative timeline (with difficulty, we're guessing). Esteemed Scottish actor Robert Carlyle returns to voice Gabriel/Dracula, and is joined by fellow countrymen Alec Newman and Richard Madden. Carlyle rose to fame following his portrayal of the slightly mad Begbie in Danny Boyle's seminal movie Trainspotting, and has since starred in numerous critically acclaimed films and TV shows, including The Full Monty and Stargate Universe. 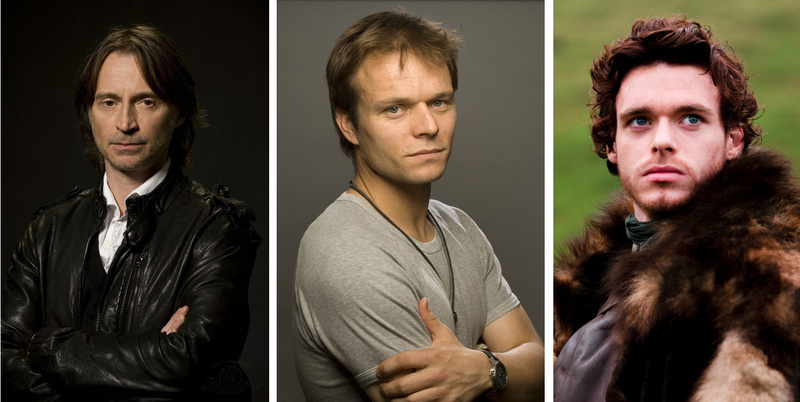 Simon Belmont is voiced by Alec Newman, who is possibly best known in the US for his role in the TV adaptation of Frank Herbert's Dune. In the UK he's currently appearing in the drama Waterloo Road, and has done voice over work for other video games, including Star Wars: The Old Republic and Dragon Age 2. Richard Madden utters the words of Trevor Belmont, and will be instantly recognisable to fans of the fantasy TV series Game of Thrones, in which he plays the role of Robb Stark. So there you have it - Castlevania's cast is packed to bursting point with Scots, so don't be surprised if Dracula is seen wearing a kilt, eating haggis and playing the bagpipes during the game's 20 hour duration. First Castlevania game for me! Hopefully it won't be my last. Robert Carlyle AND Castlevania on a 3DS Cartidge?! I think Alucard is either Trevor or Simon (which ever one is his son in the story) having been turned by Gabriel, which would make sense to me. @WaveWitch They look to the future and for who can give them profit. I instantly recognized Carlyle's voice on the new trailer, but that is some seriously talented voice up there. I do hope the game delivers. I couldn't agreed more..Both titles were my favourites..and now look at them. The King in the North and the kwisatz haderach together in one game? This must be a dream. Whenever JP games gets a touch of the west it somewhat turns to rubbish. No disrespect meant for great games produced in the west. Castlevania has a powerhouse of voice talent on it, But 20 hours for a castlevania game? Too short for me. Cmon give it more exploration and nuff of the action. I'll wait for more detailed review on it before I buy it. @Happy_Mask You don't know classic Castlevania games. Trevor Belmont better just stay far away from weddings, if he knows what's good for him. I loved the voice work on Lords of Shadows, especially Robert Carlyle, so I expect nothing less but greatness from their interpretation on Mirror of Fate. As long as the voice acting is better than what Symphony of the Night had I'll be happy. Oh damn, I'm a huge DUNE fan. I point out Alec Newman to people whenever I get a chance. I really don't get why everyone is complaining about this game being 20 hours unless Castlevania games are normally longer than that (I wouldn't know as I haven't played any games in this series yet). I think 20 hours is a pretty good length for a game. I liked LORDS OF SHADOW very much. While I would have preferred a 'metroidvania' I believe Mercury Stream did an amazing job rebooting the franchise. And I think a Spanish developer should not be downplayed by being a Western Developer. It's not like Konami gave the franchise to Neversoft or Radical.